City Square is delighted to sponsor and host a hare for the Jack & Jill Foundation in conjunction with Newtown School. A group of young social innovators from Newtown School in Waterford City have launched an Education and Community Partnership Project. They are piloting their very own “Hares on the March Waterford” project in association with the Jack and Jill Foundation. 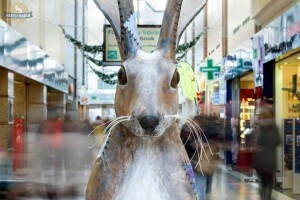 10 Giant Hare Works of Art, designed by young Waterford People around the city are in 10 different host locations in Waterford.. Follow the trail (walk, jog, run) and find all 10 hares and fill in their details & codes into our competition brochure to be in with a chance to win some epic prizes! A fun and novel way to get fit and engage with a community art initiative in 2016! There is a dedicated facebook and twitter page for the Waterford campaign. Post your comments and selfies / photos with a Hare on social media ‪#‎WaterfordHares for a chance to win spot prizes. Each of the 10 hares will be available for adoption or purchase at auction to raise money for the Jack and Jill Foundation once the fitness trail finishes! Fitness trail Maps and Competition Entry Forms will be available from the Tourist Office or any of the 10 host venues including City Square Shopping Centre. Students from Mount Sion CBS, Christchurch NS, Waterpark College and Waterford Youth Arts to decorate 10 pieces of “Hare art”. “Hares on the March” is a Jack and Jill Foundation public arts initiative that will see 100 unique pieces of art in the form of giant hares decorated by well known Irish artists adorn the streets of Dublin as well as Waterford now, thanks to our initiative. The Jack and Jill Foundation, now in operation for 18 years, provide home nursing care to over 1800 children with severe disabilities who require around the clock care in their own homes. They support children in every community and a campaign like this means a lot to our families in terms of reminding them that there are artists and young people out there, ready willing and able to use their skill to produce wonderful art for an initiative that allows us to raise awareness and funds.